Juncus acutus is a large rush with a spectacular architectural form. Its spiny sharp-ended stems mean that it should be planted away from walkways however. 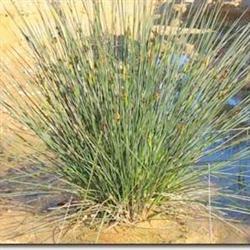 It looks at home in a dry streambed planting or as a specimen alongside other large natives. Also known as "Sharp Rush", it is used for weaving traditional coiled baskets by Californian Native American Indians. It grows in heavy clay soil and saline conditions, and aprt from its benefits as a landscape plant can be used to reduce erosion and also produces compunds that inhibit the growth of algae in wetlands.